Low maintenance front garden with paths, lawn and raised beds. Materials: Vitrified paving, block edging, artificial grass, oak sleepers. Small, low maintenance garden with seating areas, lawn, pergola and screened bin area. 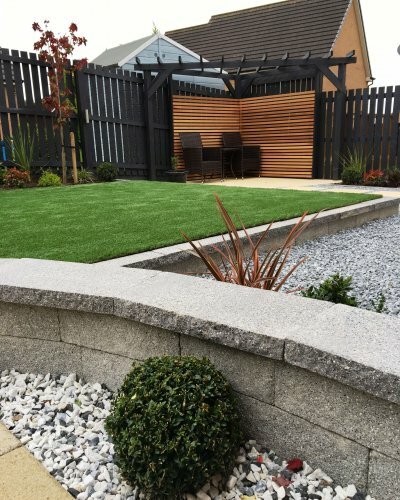 Materials: Vitrified paving, artificial grass, larch screens and pergola. Rustic decking with balustrade and steps. Materials: Composite ‘driftwood’, posts, rope. Communal garden with several patios, wide paths, raised beds and timber screening. 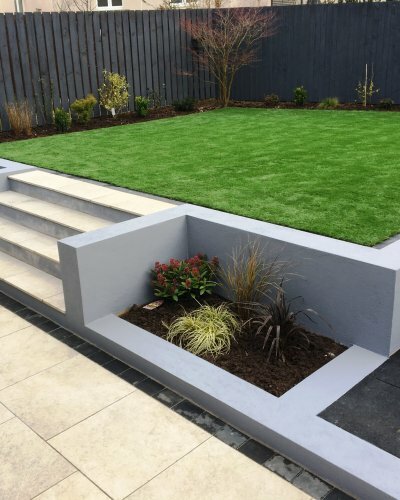 Materials: Natural Sandstone, Block edging, softwood timber and artificial grass. Large traditional patio with incorporated flower bed, balustrades and steps. Materials: Natural Sandstone, Block edging, Precast balustrade. Contemporary back garden with seating areas, lawn, pergola and lights. Materials: artificial grass, Argent walling, cedar battens, spot lights.